IBM® invented the virtualization technology starting in the 1960s on the mainframe, and the functionalities evolved and were ported to other platforms and improved the reliability, availability, and serviceability (RAS) features. With virtualization, you achieve better asset utilization, reduced operating costs, and faster responsiveness to changing business demands. Every technology vendor in the SAP ecosystem understands virtualization as slightly different capabilities on different levels (storage and server hardware, processor, memory, I/O resources or the application, and so on). It is important to understand exactly what functionality is offered and how it supports the client’s business requirements. 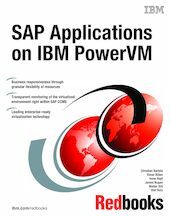 In this IBM Redbooks® publication we focus on server virtualization technologies in the IBM Power Systems™ hardware, AIX®, IBM i, and Linux space and what they mean specifically for SAP applications running on this platform. SAP clients can leverage the technology that the IBM Power Systems platform offers. In this book, we describe the technologies and functions, what they mean, and how they apply to the SAP system landscape.